These cupcakes are full of spice and fun and zest! Easy to make these firecracker cupcakes! These cupcakes have absolutely no nutritional value, at all. But they have all sorts of giggling value! And that’s something. Firecracker cupcakes. They are cupcakes, which are always fun. And on top of that, they have hot sauce, pop rocks, and other fun additions. I dare you to try this sometime with your kids and not giggle as you eat them! 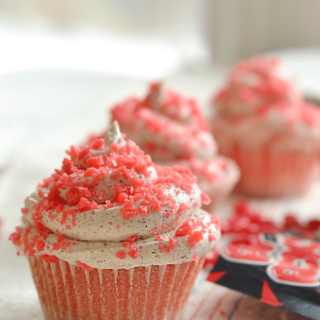 When I see another firecracker cupcake recipe on Pinterest or other social media I get excited… until I click over and see that it is simply a decorative firecracker cupcake. As in, it’s NOT exploding in your mouth stuff. Lame. I want a firecracker in my mouth AND a pretty cupcake. So, I took matters into my own hands with these cupcakes. These cupcakes are quite simple and a great Fourth of July dessert. In fact, my daughter did a good majority of the baking! They are gooey, spicy, and fun to eat because they taste like Red Hot candies dipped in Pop Rocks. My kids were nuts over them and I continue to make them often. Honestly, I loved them too…so fun! But, be aware…the flavor mostly comes from the frosting…not the cupcakes! Don’t skip the frosting! Or the Pop Rocks. Note: Pop Rocks have become increasingly difficult to find. I can grab them from my local candy store or on Amazon. When I find them, I pick up multiple packages to have on hand for these cupcakes. 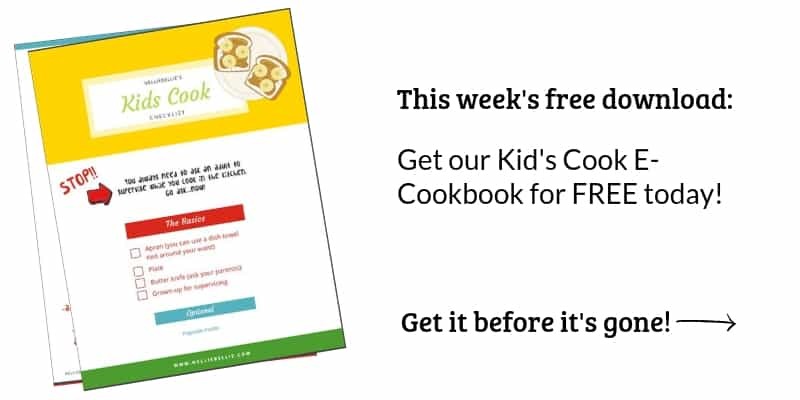 Prepare a package of white cake mix (or homemade!) according to the directions for cupcakes. Tip: spray the cupcake liners to help them come off the cake better. These are gooey! Mix the butter and powdered sugar. Add the rest of the frosting ingredients to the sugar and butter. Beat together an additional 2 minutes. If desired, more cinnamon and hot sauce can be added to increase heat. Fold in some pop rocks. 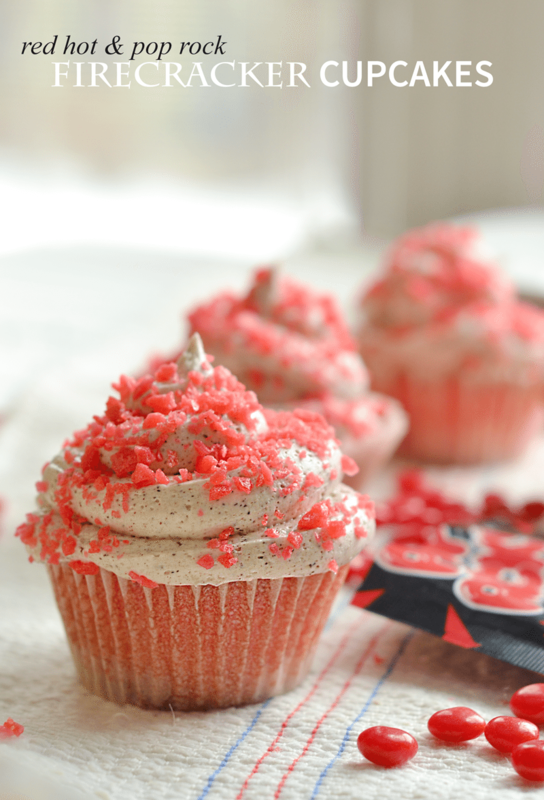 There you have it…a Redhot Cupcake Recipe the kids will be loving and are great fun for the Fourth of July and more. Note: Sometimes when I make these, I scoop out a bit of the center of the cooled cupcake and fill it with Pop Rocks before icing. But this only works with cooled cake. Warm cake will activate the Pop Rocks before you get to bite into it. Tip: These are fun to add star sprinkles, metallic cupcake toppers, or patriotic cupcake liners to! Do you have any problem with the pop rocks popping when added to the frosting? Or do they stay intact until eaten? Can they be made ahead of time? No, I don’t. I make sure that the cake is cooled before adding them. Because the cake is dry the pop rocks won’t pop. The very top ones that touch the frosting probably do. But, not the others. Yes, I have made them ahead of time with no problems! These look like a party in my mouth kind of cupcake, yum! I’m off gluten so I’m not even going to torture myself and read this post!